The following blog post should probably be categorized under “0ld news that not many people care about anymore.” But sometimes I get some sort of prompt that reminds me of something else, and so on. 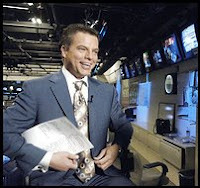 My prompt for this post was seeing Shepard Smith on the Fox Report saying something incredibly sarcastic(and funny). When I told Sean Hannity, “That’s all the perspective you need,” I was aware that thousands of people were living on a freeway in 95-degree weather, that some of them needed insulin, and some of them needed baby formula, and right over that bridge those things existed, and they weren’t allowed to go there. That was my whole world. I did not know that the rest of the world had turned this political. How the f*ck could they have done that? I was so astonished to get on one of our opinion programs — Hannity & Colmes — and to learn that the rest of the world was apparently thinking of Katrina in terms of left and right, R and D. Poverty is not a new thing to me. Segregation is not a new thing. But that these happen to be the people who are now in need, and no leadership is emerging to give them what they need, was beyond all reason. So that was all the perspective he needed. [Sean] just didn’t know that. I have always liked Shepard Smith, but after that coverage I became a fan – mostly because he made it very clear to the viewer that these were human beings in dire need of attention, not just some breaking news story. In my opinion, he is someone that takes the business of reporting the news very seriously. He does not however, take himself or the media circus that he often finds himself the unwitting ring master of very seriously. The following video is not a commentary on whether or not I think OJ Simpson is a murderer, whether justice can truly be blind when a celebrity is involved, or my personal opinion of Fox News Channel. The reason for this post has nothing to do with the aforementioned topics. I am posting this video because when it originally aired in November of 2007, I thought it was just about the most outrageously funny commentary I’ve ever heard on television. And because, as the title of the post indicates, I heart Shepard Smith.